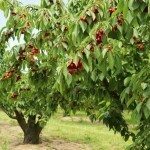 If you’re looking for a tasty cherry that is very hardy and grows in a shrub form, look no further than the Romeo cherry tree. More of a shrub than a tree, this dwarf variety produces fruit and spring flowers abundantly, grows in norther regions of the U.S., and resists many diseases. Romeo is a newer variety of cherry that was developed at the University of Saskatchewan in Canada. It belongs to a group of cherry varieties developed there that are often called prairie cherries. They were all designed to be hardy, resist diseases, grow small, and produce a lot of fruit. The Romeo variety produces dark red, juicy cherries that are more tart than sweet but have a delicious flavor. The juiciness makes them great for pressing into juice, but you can also eat these cherries fresh and bake with them. Romeo grows like a shrub and only to 6 or 8 feet (1.8 to 2.4 m.) in height. It is hardy through zone 2, which means it can be grown even in the coldest parts of the 48 states and even in many parts of Alaska. Grow your Romeo cherry tree in a spot with full sun and in soil that drains well and is slightly acidic. 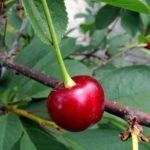 Cherries prefer to have moist soil but not standing water, so they will need regular watering during the growing season, especially in the first two to three years. Take special care to water the tree during dry spells in the summer. Prune during the winter or early spring before new growth appears to keep a neat and tidy shape and to ensure good air flow between branches. Your Romeo cherry is self-pollinating, which means it will set fruit without having another cherry variety nearby to pollinate it. However, having that additional variety will improve pollination and result in more fruit. Harvest Romeo cherry fruits when they are ripe or just before ripening. They should be ready around the end of August or early in September. Other varieties of prairie cherry, like Carmine Jewel, are ready as much as a month earlier, so if you plant more than one type, you can get a more continuous harvest.